I'm no boxer, but I'm a pretty big fan and have been watching the sport since way back when Tyson was biting off ears and the heavyweight division was full of the likes of Lennox Lewis, Evander Holyfield and George Foreman, pre-grilling days. I've also tried a decent amount of boxing-based workouts and have a punch bag set up ready to soak up my flurries on a regular basis. So when boxing wearables became a thing I was instantly sold on the idea. One of the first companies to bring the science together with wearables is Hykso, which has built a pair of connected punch trackers. You can slip them inside your hand wraps and they'll serve up punch data for serious fighters sparring against an opponent, as well as those who just want to use boxing to sweat it out and get that bit fitter. If you want a bit more of a background on the story of Hykso, read our interview with former US national boxing team member turned founder Tommy Duquette to find out what inspired him. Now the $190 trackers are available to buy and I've been putting them through their paces to see if this wearable is bringing something new to the sports tracking game. The punch tracking smarts are contained within two small trackers that measure in at just 6.5mm thick and weigh 5.4g. They look a bit like small USB sticks with no ports or buttons, with just an LED that indicates battery status and left hand/right hand. They're so tiny and light that you won't feel them under the wraps or gloves, and crucially they don't cause any discomfort whatsoever. Inside each one lies a 3-axis accelerometer and a 3-axis gyroscope, sensors you'll find in most fitness trackers. It's the software that interprets motion data that's different, though, providing real-time punch data to the smartphone app (iOS and Android) via Bluetooth. Before they are hidden away inside your hand wraps, you need to pair them, which thankfully is a very straightforward process. A little tap wakes the trackers up and blue and red lights indicate which is for the left and which is for the right hand, and that they are ready to be paired up. Then it's time to get them fitted – which is easier when someone is doing your wraps up for you, as the tracker can at times fly out as you're trying to secure it in place. You need to get them positioned just below the wrist and facing out towards your fist. Make sure they are secure as well, otherwise they won't pick up accurate data. On one occasion my right-hand tracker didn't register punching power properly, but that was entirely down to not having made sure the wraps were securely holding the tracker in place. Once the trackers are in, don't whip those gloves on just yet as you'll need to go back to the app to set up your session. Away from the fairly self-explanatory activity feeds, your focus will be on the Train and Drills section. In training you can either set up rounds or go for manual tracking. You can also factor in rests between rounds to emulate that scenario of stepping into a ring. In the advanced section you can create drills which support heavy bag, sparring, shadow, mitts work and other freestyle workouts. It's worth digging into the settings menu as you can turn on those familiar bell warnings and the 30 second mark, but you can also select the option of punching to start a session so you don't need to worry about tinkering with your phone. Then it's time to get boxing, and the first hope is that the punch tracking is accurate. The good news is that it is. With a phone propped up showing the punches in real-time it recognised each and every punch thrown, so it passes that first test. Aside from counting punches, the trackers will also record an average velocity score, to give you an indication of punch speed, and an intensity score to measure those effort levels. Post workout, you can drill down into these scores to show individual speed and power. It's also really easy to identify where performances have dropped or increased during a session, or whether you're saving those bigger combos for the later or earlier rounds. The most rewarding training mode is when you opt for tracking by rounds. This will let you see how you perform round by round, scoring you out of 10 on the different metrics. It also brings into play one of the wearable's nicest features, which lets you tap the gloves together during tracking to navigate through the different data without needing to take off your gloves to touch your phone or tablet screen. As far as battery life is concerned, the trackers promise 10 hours and charge from flat to full in just one hour. They also comes bundled with a handy cradle where both trackers clip into, and this can be plugged straight into a USB charging port. I've been using Hykso for a few weeks now, throwing in heavy bag and shadow boxing sessions in between my running and normal gym workouts. I have to say that I've really been impressed, not only by how well they work, but by just how much thought has gone into the design of these dinky little trackers. I can see how these would appeal more to serious boxers but I got just as much use out of them. The real-time data had that motivating effect to put in more punches the following round or to at least keep up my intensity levels. 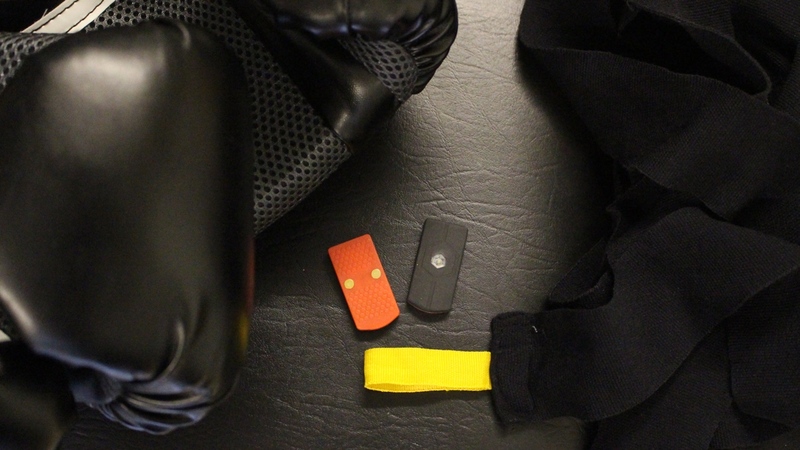 There aren't many other wearable setups to compare the Hykso to right now, but I'd say it's far more focused on boxing than Moov's Now sensors, for example. While I haven't tried out PIQ and Everlast's boxing wearable, I'm a bigger fan of the significantly smaller stature of the Hykso trackers. What comes next is really key here. After punch tracking the logical step is being able to recognise different types of punches thrown, and also offering coaching to perfect punch form and become a better boxer. I have no doubt that's in the works. But for a boxing amateur like me there's still a whole lot to like about the trackers that pack a real punch. I definitely won't be throwing them into my drawer of wearable tech failure.